The cool breeze of Autumn is well and truly here to stay. I am wearing socks in the house, which means goodbye cold salads and hello hearty, morish hot meals! 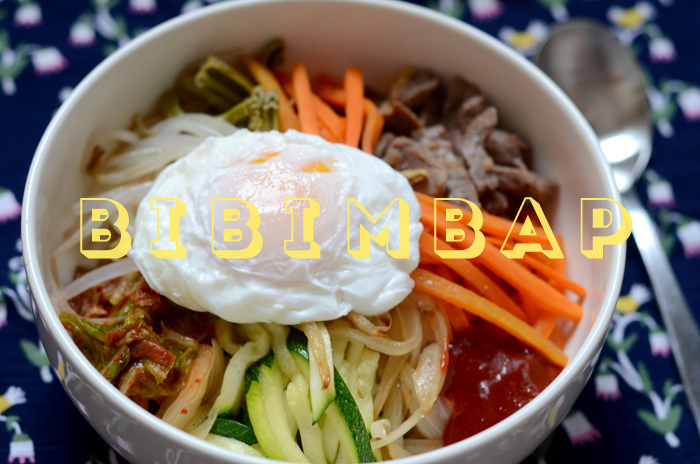 There’s some great Korean food here in NYC but Bibimbap is one of my favorite dishes, and ever since we found a Korean grocery in the neighborhood, I have been loving cooking with the fresh tofu & kimchee that they sell. 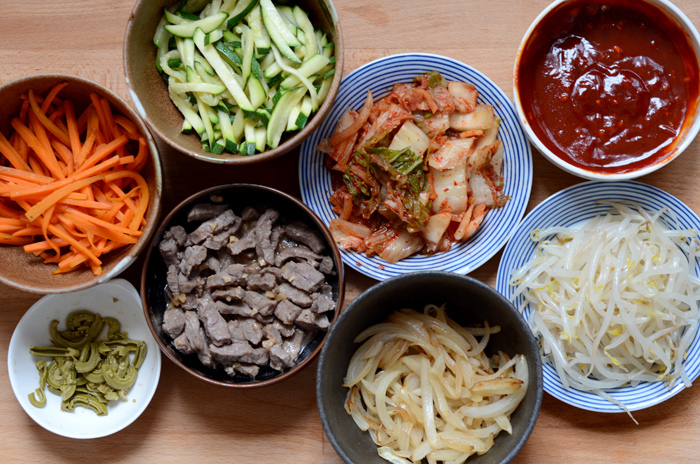 If my sources serve me correctly, Bibimbap (비빔밥) means ‘mixed rice’. Respectfully, I would like to disagree, that it’s a little more than simply mixed rice, more than just a sum of its parts. 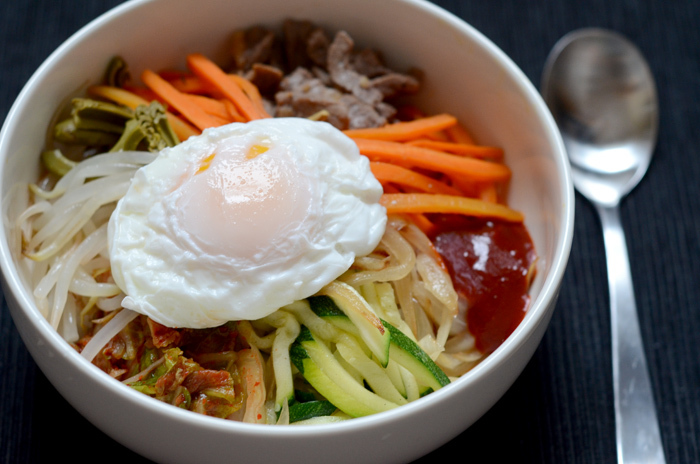 I’ve seen a lot of different vegetables being used, so I think it’s fairly varied — but the key is the Gochujang sauce and of course, a runny egg at the very end to bind everything together. It does seem like a lot of different elements, but I only used one pan and one pot, and working systematically it took all of an hour to prepare — totally worth it! 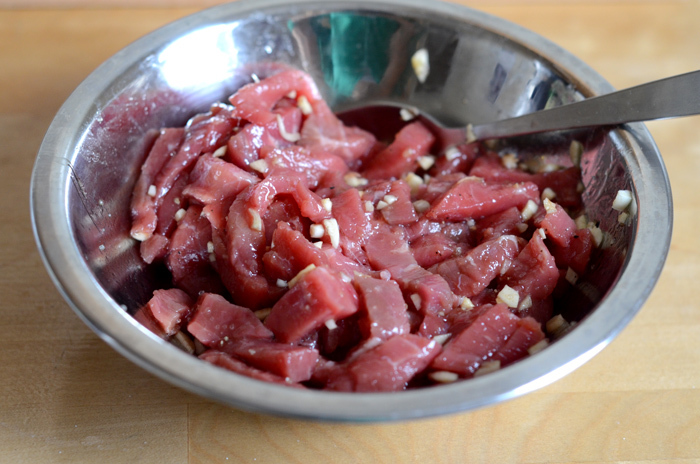 Cut the beef into small pieces and marinate with garlic, wine, soy sauce, sugar and sesame oil and set aside. Set the rice and leave the beef to marinate, at least 20 minutes before cooking. 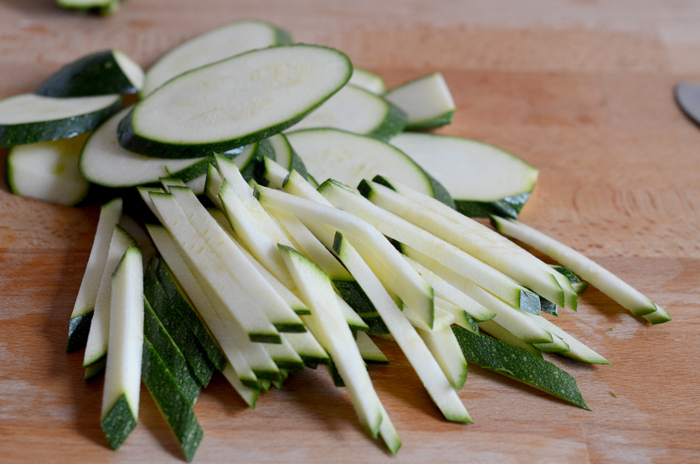 Cut the zucchini into slices diagonally, then into matchsticks. 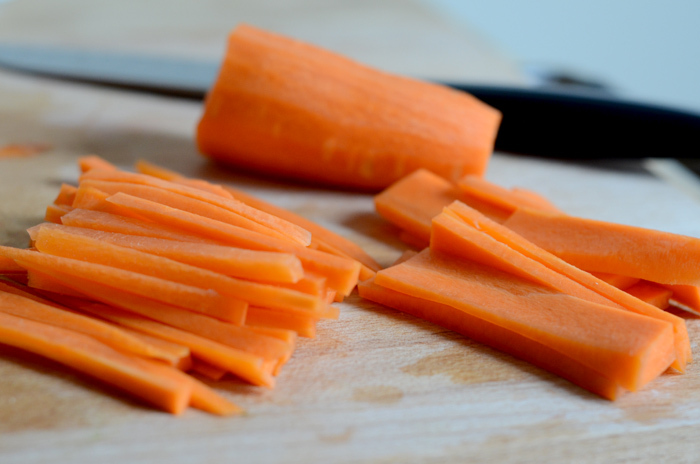 Cut the carrot into three lengthwise, into slices and then matchsticks similar in size to the zucchini. Set aside. 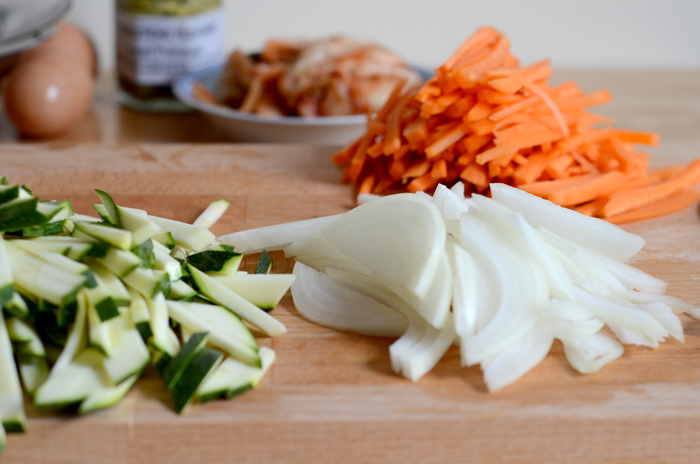 Cut the onion into thin slices, so that they are a similar size to the zucchini and carrot. 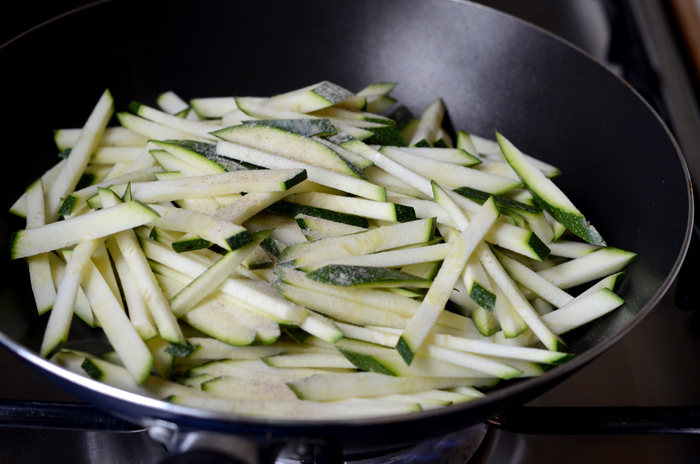 Heat a small amount of olive oil in a pan, and sauté the zucchini with some salt and white pepper. Start cooking the rice. Remove the zucchini from the pan and set aside. I cooked in the order zucchini > onion > carrot > beef so that I didn’t have to wash the pan in between. 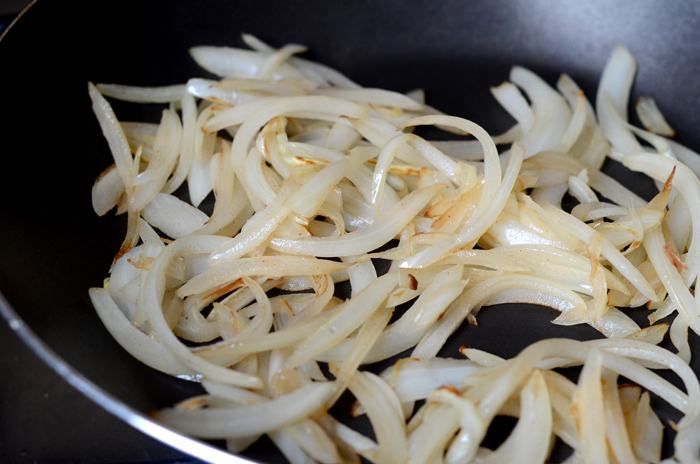 Similarly, sauté the onion with some salt and white pepper on low to medium heat, until translucent. The onions take a little while, so in the meantime boil the bean sprouts for a few minutes, drain and marinate with salt and some sesame oil. Cut up the kimchi into bite sized pieces. 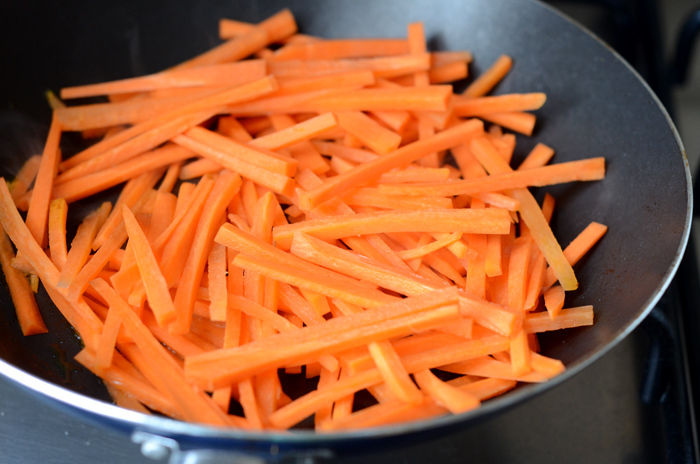 Sauté the carrot with salt, white pepper and a small amount of cooking wine or mirin. 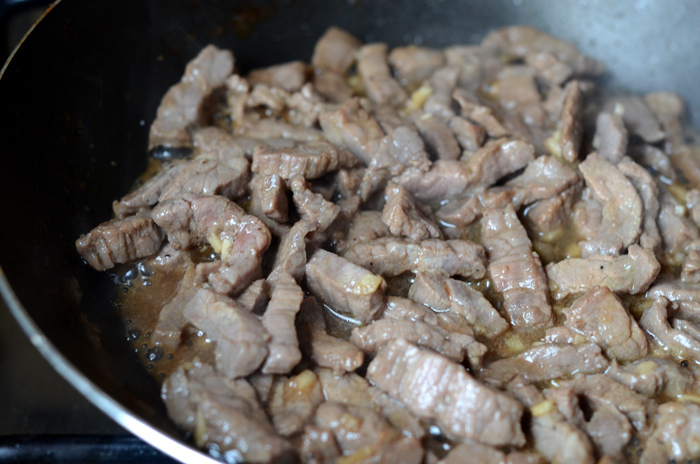 Lastly, sauté the marinated beef. 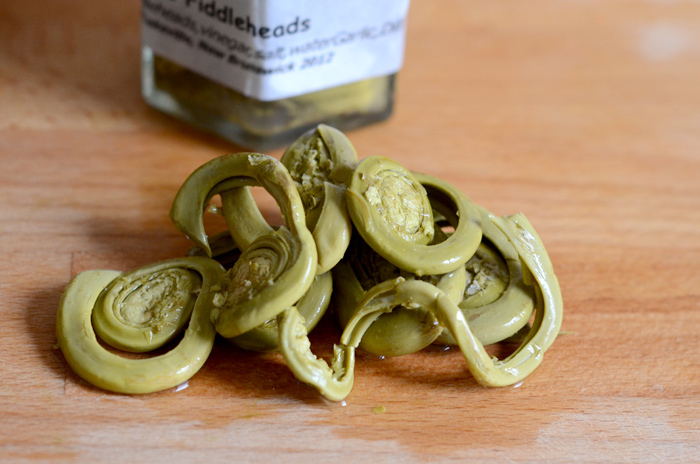 Here are the ferns I used, they are “Pickled Fiddleheads” and a gift from our friends that visited Canada recently. The Koreans use a different kind of fern(“gosari”), and we have a certain type that we use in Japan(“zenmai”) but I thought this could be a nice replacement. They are lightly pickled, so I cut them in half and marinated them in a bit of sesame oil and soy sauce to ‘convince’ it that it was going to be part of an Asian dish. 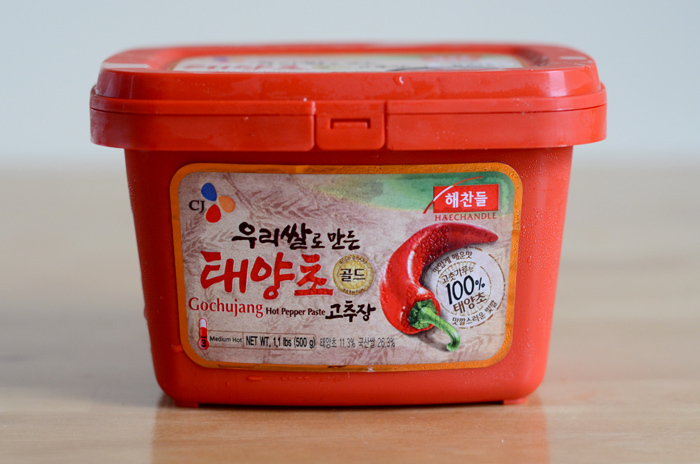 Here is the Gochujang I used, the three little black letters next to Hot Pepper Paste(고추장) are what you need to look for if there is no English on the packaging. 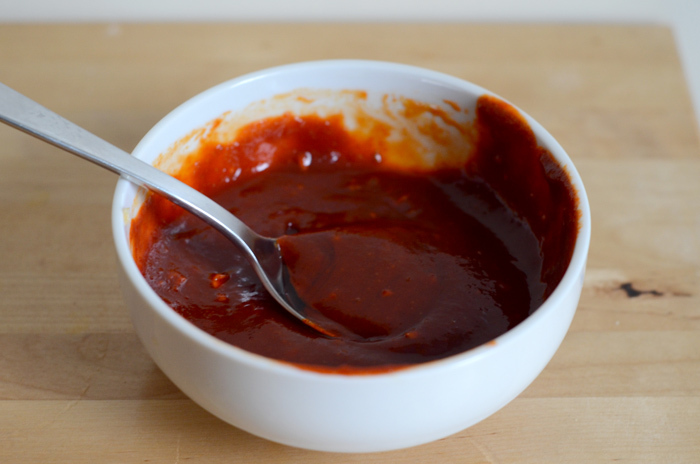 Mix the ingredients for the chilli sauce, if you don’t like it too hot you can control it using the sugar and vinegar. It should be fairly potent though, and you can always use less of it. 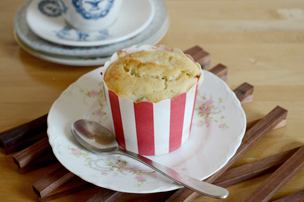 I used golden syrup (which is just raw sugar liquified) because I thought it might dissolve better. If you are using sugar, it may be better to dissolve the sugar in the vinegar first. Here are all the ingredients, cooked and ready to go. Once the rice has finished cooking, don’t open it for about ten minutes, give it a fluff and leave to steam for at least 15 minutes to have perfect rice. The last step is to make a runny poached egg to top it off. Here is the dish assembled. I find it easier to pile the rice a little higher in the middle, then fill the ingredients a bit like you’re making a pie chart. 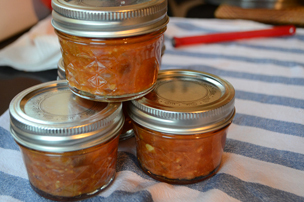 I put equal amounts of zucchini, carrot, kimchi and smaller amounts of onion and fern. Add some chilli sauce to taste and top it all off with an egg. Mix it all up and enjoy!